TTi will be displaying at the AgQuip Field Day for the first time this year! The Commonwealth Bank AgQuip Field Days are Australia’s largest agricultural showcase. Held over three days in Gunnedah, NSW, AgQuip attracts over 100,000 visitors – the largest visitation of any rural field day in the country. 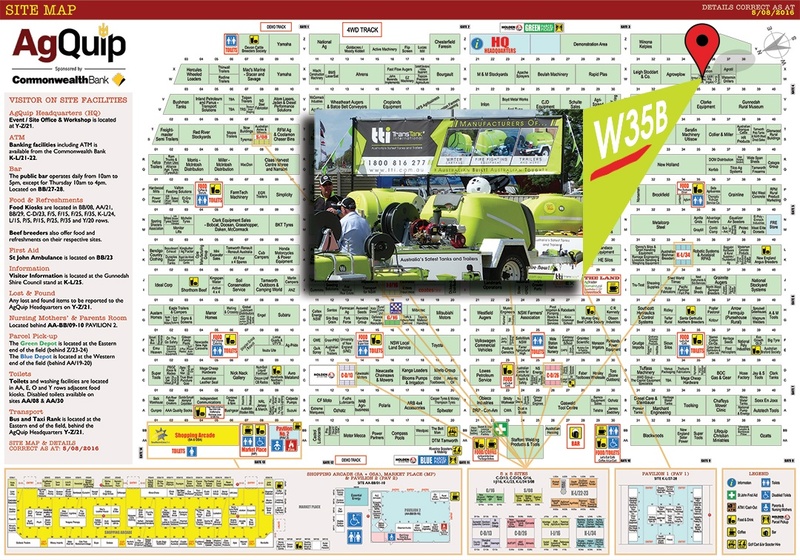 Each year, over 3,000 companies are represented at AgQuip. This allows for the latest machinery, equipment and services to be accessible to those on the land – many major companies use this event as an opportunity to introduce new products or developments in existing product ranges. AgQuip revolutionised the agricultural field day in Australia, creating “a heavily promoted, shop-floor atmosphere, with no barriers between buyers and sellers, and all efforts geared to results – on site and as flow-on sales”. This concept has been fundamental to the success of AgQuip, even through times of drought, flood and recession. We’ll be displaying a range of spray units and trailers, diesel transfer units and firefighting equipment, so make sure you drop in and have a chat to Dale and Andrew! TTi is continuing to grow its presence through this region with a number of new ‘Local Active Dealers’ coming on board in recent weeks – you can be sure there is a dealer not far from you!